Hello friends, I found this special banana and milk diet last week on the Internet and thought to give it a try for 4 days to find whether it is really worth. Below is the review of the milk and banana diet along with my findings (pros and cons). If you’ve a special occasion coming in a week or so, and your dresses are a bit tight, then this special diet will definitely help you lose around 3 to 4 kgs in just 4 days. It is proved to be effective and if practiced, you’ll definitely become lighter by a few pounds. However, there are a few cons of this diet, which I’ll be discussing later in this post. Also find the 7 day GM Diet chart which helps you lose more than 5 kgs in a week. If you want to live a healthy lifestyle, this 1200 calorie mean plan might be helpful. What is Banana-Milk Diet? How does it Work? This diet just involves eating bananas and drinking milk for 4 days. The program was actually developed in the year 1934 by Dr.George Harrop. The main logic behind this special menu was to make our body to consume fewer calories than usual, but still stay healthy. Both the milk and banana have got many health benefits which help us stay fit during the diet. The follower of this diet will be consuming less than 1000 calories per day, making him lose weight easily. You’ll get ~ 100 calories in a single medium sized banana and ~ 80 calories in a cup of skimmed milk (250ml). So, by combining the total bananas (6) and milk (3 cups), you will not get more than 900 calories per day. 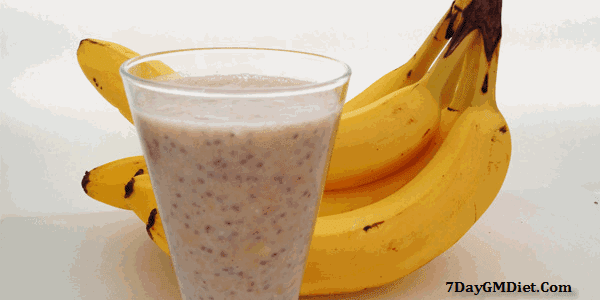 How to Follow the Banana and Milk Diet Plan? This is just a sample menu and you can have these foods separately or mix them together for a delicious milkshake. It is your choice. P.S: This diet should not be followed for more than 4 days continuously. If you want to lose more weight, you can start this banana milk diet after a week gap, but not immediately. There are many benefits of this special weight loss diet and it is proved be very effective in shedding extra pounds easily. Well, let us look at the major benefits we get from these foods. Banana is very rich in vitamins and minerals, especially Potassium. A medium sized banana contains ~ 422 mg potassium, and this helps in the functioning of our body. You’ll also get 3gms of fiber in a banana. Fiber helps in smooth digestion and flushes toxins from your body. Eating banana will make you full for longer periods, so that you won’t munch on high calorie snacks before the next meal. Milk is rich in Calcium and Proteins. However, it is suggested to have low-fat or skimmed milk for this diet, as it will not contain any fat. While the Calcium is for strengthening the bones, Proteins are for developing muscles. So, Milk and banana when combined is sufficient to fulfil the needs of your body and help it sustain for at least 3 to 4 days. Everyone wishing to lose weight can follow this diet, but you’ll need to know a few points before following the diet. Since, you’re consuming, incredibly lesser calories than normal, you’ll feel a bit weak and it is normal. In case if you’re not able to control the appetite, you can drink the cabbage soup (during the mid – snack time) which is healthy too. Women should not follow this diet during their menstrual cycle. In case if you still want to follow it during the periods, then make sure you take the vitamin & mineral supplements too. As the vital elements are missing in this diet, it is not suggested to practice this diet for more than 4 days continuously. Give at least a week gap before starting another session. That’s all friends! I followed this diet last week and lost 3 kgs (2.8 to be exact) in 4 days. Well, I felt a bit nauseous on the first day itself, and so I drank a bowl of wonder soup after the lunch, which made my day. So, please don’t hesitate to have the normal meal in case if you’re not able to continue the diet. All the best 🙂 Please share your results with us in the below comments section.